Update: It was fake, because of course it was. As found out by other news outlets, Ted Carson’s Facebook page was hacked, turned into a personal page, and the banner image replaced with the one that started all the speculation. So looks like we’ll still be waiting a while for Valve to count to 3. Original Story: By now gamers everywhere have learned the hard truth: Valve can’t count to 3. We’ve been waiting a long time for any sign of a third installment in any of Valve’s big franchises. Half-Life 2: Episode Three? Nope. Half-Life 3? Nope. Portal 3? Apparently not. Team Fortress 3? Team Fortress 2 is too busy printing money with hats. Left 4 Dead 3? Well, maybe. Within the last 48 hours, Valve’s Ted Carson changed his Facebook banner to this image. Now, to my knowledge, this is from the one of the previous Left 4 Dead games. I haven’t played them in a while so I can’t quite remember, but it does look familiar. That being said, the choice of image is certainly interesting. The original Left 4 Dead’s cover art featured a single hand with a thumb missing. The four fingers represented the 4 playable characters(and the 4 in the title), while the missing thumb marked the 1st installment. 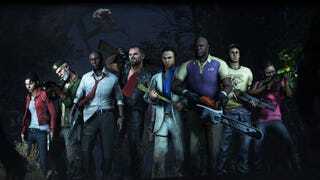 Then along came Left 4 Dead 2. The thumb was still missing, but two fingers were bent downward, leaving two fingers still straightened out, indicating the second installment. The new image, seemingly taken from a previous game, has the thumb and pinky missing, leaving three fingers. If this is more than just a random image Ted Carson picked, it means Left 4 Dead 3 is finally on the horizon after all these years. Years ago we got various leaks and rumors that Left 4 Dead 3 was in active development at Valve using the new Source 2 engine. This was accompanied by a supposed screenshot showing a familiar location, but with updated graphics. This, of course, came alongside a leak of internal Valve documents that indicated a lot of staff were working on “l4d3.” Ted Carson is one of those supposed developers attached to the project, and now he’s seemingly teased the long rumored sequel. One can only speculate as to when an official announcement would even take place. Valve, like Rockstar, tends to do things its own way and doesn’t really care for the usual trade shows that most publishers debut new games at. This tease could be for an announcement coming very soon, or it could be for later this year because Valve likes to keep people waiting.